Marcellus Powell Adams was born on 14 August 1898 in Cameron, Milam County, Texas. Powell Orgain Adams and Mary Laurence Taber appeared in the US federal census of 1 June 1900 in Cameron, Milam County, Texas, at Belton Street. Other members of the household included Marcellus Powell Adams, Sarah Elizabeth Powell. Also in the household were three young female boarders. The following appeared on 24 November 1901 in The Houston Post: (Cameron) Mrs. P. O. Adams and family are visiting George Adams' family of Buckholts. Powell Orgain Adams and Mary Laurence Taber appeared in the US federal census of 15 April 1910 in Cameron, Milam County, Texas, at Roberts Street Also living in the household were boarders Mattie and Minnie Edwards.. Other members of the household included Marcellus Powell Adams, Walter Brooks Adams, Alice Louise Adams, Mary Elizabeth Adams and Arthur Taber Adams. Marcellus Powell Adams registered for the draft on 11 September 1918 in Cameron, Milam County, Texas, while a student in the SATC (Student Army Training Corps) at Fort Sheridan, Illinois. The following appeared on 7 November 1918 in The Cameron Herald: P. O. Adams and daughter, Louise, motored to Georgetown Saturday and returned accompanied by Jack Adams, Swick Hiemer and Misses Oleter Youngblood and Ophelia Bourers, all of the Southwestern University. T.
Powell Orgain Adams and Mary Laurence Taber appeared in the US federal census of 1 January 1920 in Cameron, Milam County, Texas, at East Fifteenth Street. Other members of the household included Marcellus Powell Adams, Walter Brooks Adams, Alice Louise Adams, Mary Elizabeth Adams, Arthur Taber Adams and George Felix Adams. 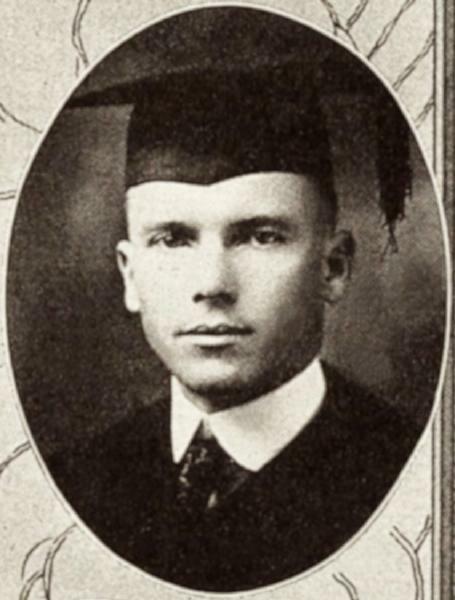 The following appeared on 17 June 1920 in The Cameron Herald: Mr. P. O. Adams, Miss Louise Adams and Mamie Lee Tabor of Austin, motored over to Georgetown Saturday to be present at the graduation of Mr. Adams' son Jack, who is a member of the Class of 1920. The following appeared on 10 January 1924 in The Cameron Herald: Walter Adams, traveling salesman for the Diamond Match Company, who spent the holidays in Cameron with his parents, Mr. and Mrs. P. O. Adams, has gone to New Orleans to report for spring work. . . . Jack Adams of Brownwood was here Sunday visiting his parents, Mr. and Mrs. P. O. Adams. He married Bernice Elizabeth Mace, daughter of John Oscar Mace and Hattie L. (? ), circa 1925. The following appeared on 27 December 1928 in The Cameron Herald: Mr. and Mrs. P. O. Adams had as their guests during the holidays their daughter and her husband, Mr. and Mrs. H. H. Daly of Houston, Mr. and Mrs. Jack Adams and baby of Lampasas, Walter Adams of San Antonio and Miss Elizabeth Adams, who teaches at the Oklahoma School near Gause. Marcellus Powell Adams and Bernice Elizabeth Mace appeared in the US federal census of 1 April 1930 in Lampasas, Lampasas County, Texas. Other members of the household included John Mace Adams. He was a commercial traveler selling knit goods, according to the 1930 census. The following appeared on 13 June 1939 in The Dallas Morning News: President Roosevelt sent to the Senate Monday the following nominations for Texas postmasters: . . . Lampasas, Marcellus P. Adams. . .
Marcellus Powell Adams and Bernice Elizabeth Mace appeared in the US federal census of 1 April 1940 in Lampasas, Lampasas County, Texas, at Third Street. Other members of the household included John Mace Adams. He was a postmaster, according to the 1940 census. The following appeared on 7 August 1953 in The Waco News-Tribune: Among the out-of-town guests who will arrive to attend the wedding of Miss Sharon Daly and James Thomas Mansfield Saturday, 8 p. m., are Dr. and Mrs. Guy Witt and Mr. and Mrs. John Mace Adams, all of Dallas. Other out-of-town guests include the uncle and aunt of the bride, Mr. and Mrs. Arthur T. Adamss of Chicago, and daughter Linda; Mr. and Mrs. Leslie Witt of Houston; Mr. and Mrs. Clint Blackmon of Fort Worth; Mr. and Mrs. M. P. Adams and daughter Marcia of Lampasas; Miss Elizabeth Adams, Mrs. Lila Bessonette, Mr. and Mrs. Barney Mansfield all of San Antonio; Miss Nancy Moffett of Dilly; Miss Virginia Dare Smith, Messrs. and Mesdames John Ward, Roy Byrd all of Austin; Mr. and Mrs. Dabney Biggers of Abilene, Mr. and Mrs. J. Eber Flinn of Cameron. Wedding rehearsal will take place Friday evening in Austin Avenue Methodist Church at 7 p. m. Mr. and Mrs. J. M. Mansfield of Austin, parents of the bridegroom, will be hosts for dinner following the rehearsal at the home of the bride's mother, Mrs. Louise A. Daly, 1308 North Fifteenth Street. At the time of his death Marcellus Powell Adams was living in Lampasas, Lampasas County, Texas, at 406 West Second Street. Marcellus Powell Adams died on 26 December 1974 at age 76 in Lampasas, Lampasas County, Texas, at Rollins-Brook Hospital . His death was officially witnessed by Bernice Elizabeth Mace. His wife Bernice Elizabeth Mace became a widow at his death.